I meant to email you last week – I”m sorry. I actually found her. Those wonderful people at Mary Meyer had one last one they sent me. My house was virtually destroyed by fire in March of 2008. My son’s room was right above where the fire started, and by the time the firemen got there, his room, and everything in it, was gone. Fortunately, no one was at home – but he lost all of his treasures, including all of his Soft Friends. 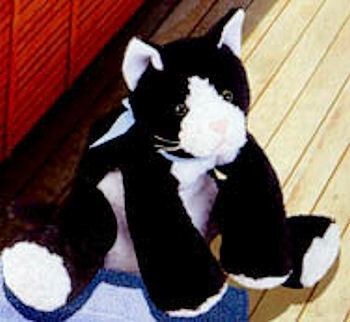 Among the lost soft friends, and one of his favorites, was his soft friend Morgan Cat. I have spent the past 15 months searching and searching for Morgan Cat – a floppy tuxedo cat (black and white) with a pink nose, whitish face, and a blue and white gingham bow (which he just described to me again this morning). I kept thinking I’d found her, and would order what looked like her, but it would arrive and was not. I eased off on my search as time passed – but my darling will ask me every so often “When is Morgan coming home.” There was so much loss, I could not bear to tell him she was gone too – and I did happen to find one of his other dear friends, and he is with us now – so I told him that Morgan was not home when the fire happened, but that she had gone to the spa and was now traveling the world, but she’d be home soon. I kept thinking he’d forget, but no… So this morning, I got on line and did a search and… I have found a picture of her and now, at last, have more identifying information – she was a Mary Meyer creation, she is now retired, “Cookie” was the Meyer name, and it was #44360. I found her on a website of retired Mary Meyer toys. Any help you can provide would be very much appreciated.